Would you like to start off the day with a giveaway? I thought you might. My friend Tiffany makes really adorable flowered headbands, in addition to a whole host of other things including brooches, belts, & skirts for little girls. Cute stuff. She’s put together a huge selection of the goods from her online store for one lucky winner. The whole lot is worth $80. It won’t get to you by Christmas, but it will get to you in time to be foxy in the new year, so how’s that for great? What do you say? Fabulous? If you want in, the details are below. Also, Tiffany is giving Petit Elefant readers 15% off your orders through the month of December. Sweet. 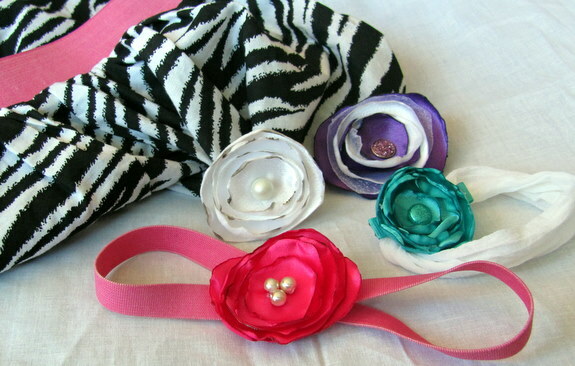 To enter the Flowered Headband & Accessories giveaway, leave a comment on this post. Giveaway ends next Tuesday, December 28th at Midnight MST. If you want to Like Petit Elefant on Facebook, youll have the inside track on giveaways like this one. If you dont want to Like it, I won’t be offended. << last minute gift ideas. Awesome giveaway! I have a little girl, myself and a photography business so All of them would get used! Great Giveaway. Everything looks so adorable. Thanks! I’ll give it to the special ladies in my life. Lovely! Would love to rock these with my new short ‘do!! Those are darling! Love ’em! Ooooo I need these. So cute. What a lovely Christmas giveaway. What a great group of accessories! I love it! My 9 month old and I would be stylin’ for sure! Those are so cute! I would love some headbands for my little girls and for me. These are darling. Love them! Ooh, cute! I especially love that mustard one! Those headbands are CUTE. Count me in! My hair is super short. I need these accessories. I hope I win! Can you hear my screaming like a small child from here? No? Good, that’d be embarassing. Almost as embarassing as me fighting with my girls over the package if I win. ohoho. what an awesome giveaway! count me in! LOVE hair pretties and more! I wanna win!! Crossing my fingers! So cute! I am a sucker for mustard yellow. LOVE Tiff’s stuff. This is great. Would love the giveaway. They are all super cute. My daughter just saw these photos and her 4-year old mind just exploded with delight! These are adorable – – and her mom could sure use a little ‘upgrading.’ Just the perfect touch! I’m IN!!! Wow. you have the best giveaways. Please, please, please, pull my name. So cute!! And such great prices too. Adorable! My little Eden and I will share these for sure! Ooh! So pretty! My two girls and I would LOVE to get these. those are some fantastic headbands…something both my daughter and I both need. um….I have three daughters and am a girl myself, so I’m thinking this is made for me? Thank you Santa Tiffany! ooh I love this giveaway! I would be the best aunt ever with these as gifts! Sweet! I don’t have a baby girl but I think everything but that dress would work for me and my girls and I’m sure we could find a worthy owner for the dress. How cute! i adore! i would love to have! Ohh! I want to win some of that amazingly cute stuff!! Her stuff is adorable. They’re beautiful and I can wear them with everything! Wow! Great giveaway! It all looks so cute! Love, love, love your site! Merry Christmas! Fingers crossed!! I am in desperate need of something so cute to wear in my hair! Thanks for all your inspiring project and ideas! OMG – these are super cute! I’m loving the color of the gold brooch that you call mustard. It is a perfect color to University of Wyoming’s Brown and Gold colors – Go Pokes! If we got this, my daughter, co-workers and all Poke supporters would be stylin’ – thanks for another awesome giveaway! Absolutely adore these headbands! My little girls was just wearing a headband with a very frilly white flower with jems in them. Love, love it. Merry Christmas! Between myself and two daughters, these would be worn every single day. All so beautiful. My daughter would love these. These are so cute! I’ve been wanting some flowers, I hope I win! Oh, the girls in this house could really rock that stash! 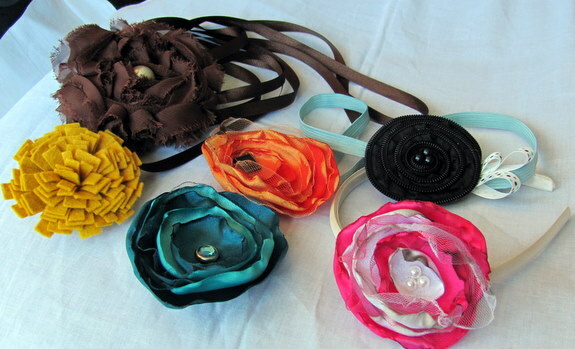 OMG these are the cutest flower headbands ever! These flower appliques have been popping up every where and are the latest rage, I myself am certainly obsessed with them. We just found out we’re having a little girl and these headbands would be so adorable! Thanks for the chance! So my daughter is bald as can be and almost 2, would love the cute bands to show that yes, she is a girl. Also would love to jazz my own hair up. Cute products. Ohhhh, there’s enough for all of my sisters to have some pretties! I really like the variety of skirts for my niece! I’m up for a giveaway! These are super cute. I happen to have 2 little girls that would love these, not to mention me. :) Adorable!! adorable–my daughter would LOVE these! I love this giveaway! I’ve got a little girl and we love to wear matchy-matchy stuff! I hope I’ll win this! Those headbands are adorable! Anyone would be lucky to have them! So cute! I love the felt brooch. Beautiful, thanks for the opportunity!